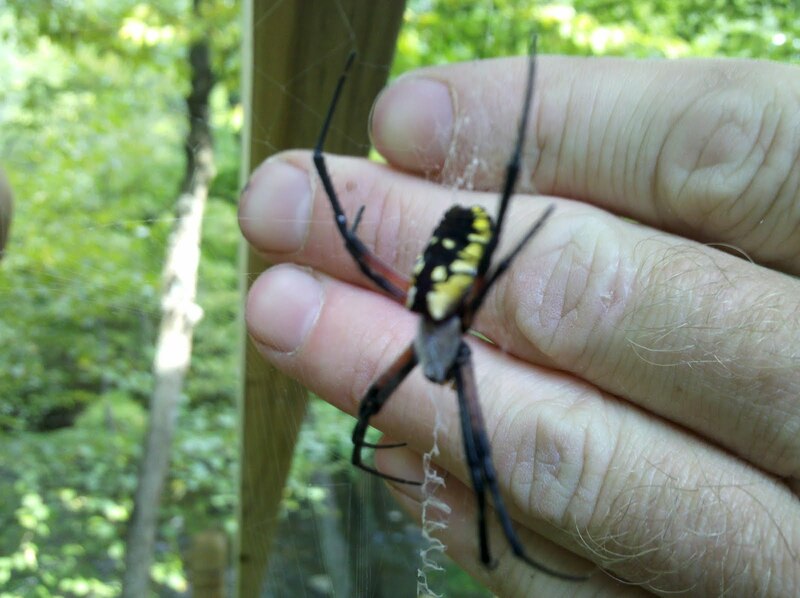 The following, are pictures of Black & Yellow Argiopes that have been submitted to me by others living in Michigan. In doing this, I am able to show pictures of spiders in Michigan that I myself have not seen, as well as more pics of those I have posted officially as being in Michigan. 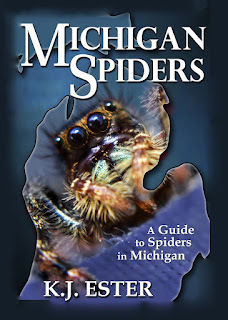 Please understand that the Black & Yellow Argiope Spiders in this section may or may not be indigenous to Michigan. I would hope that others would be honest and actually send pics of the Black & Yellow Argiopes they have actually found in Michigan, but I cannot make any guarantees. Jason - Richfield Twp, Mi. Bonnie - Bay City, Mi. I actually saw one yesterday too. My mom found one in my dad's garage. in Lawton, MI. I have to wonder if it wasn't a mom and her mate. I've seen them in close proximity to each other in my yard. He's about half her size. 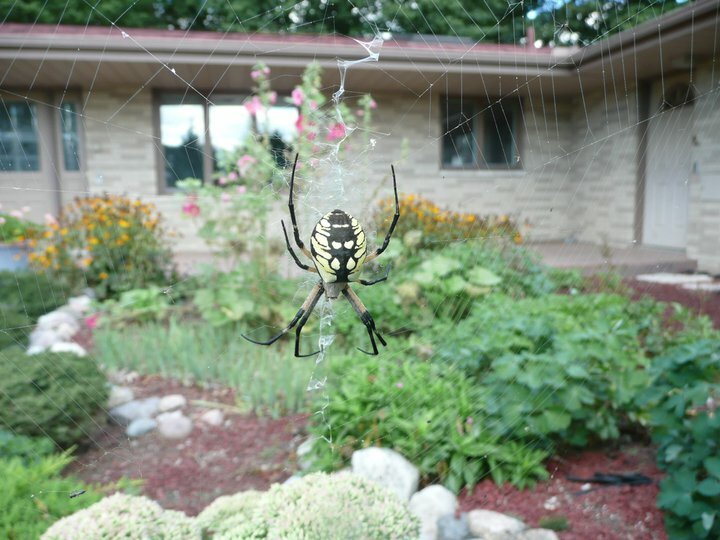 I was visiting a friend in mason michigan and she had found one of these spiders crawling along her house. I've had one for about 1month, living in my garden. It has a huge web, and I just checked it, for the 1st time since i found it, and it's huge. The web changes it's pattern, from the top, through the center, and down to the opposite edge. i do not see any young spiders. It doesn't appear to have moved at all from when i spotted it before. Is it dangerous? Not at all. It's doing your garden a service by removing other insects. Very smart to let it stay there! Found one in the shrubs next to my garden and was amazed at the size. We live in Hesperia, MI. Does anyone know if they are dangerous. How do you get rid of them, i.e. any repelants. Not dangerous to anyone who isn't a small insect. Check J. K.'s blog comments about spiders in your yard for ideas on keeping spiders away. However, consider the spider as a controller of other insects that want to come into your house. This spider has no interest in coming into your house like the insects do. It might be a good idea to keep her around! Just found one in web in Grand Bland, MI. It was in my flower bed. My son found one in the field at our home in St Johns MI. It's bigger than a 50 cent piece. If I knew how I'd post a pic. I found 3 in my gardens just yesterday in Columbus Township, MI. I think I saw one yesterday 9/12/12, took a pic but dont know how to post it. Just spotted a huge one in Holly, MI today it scared the begeebers out of me! Are they poisonous? 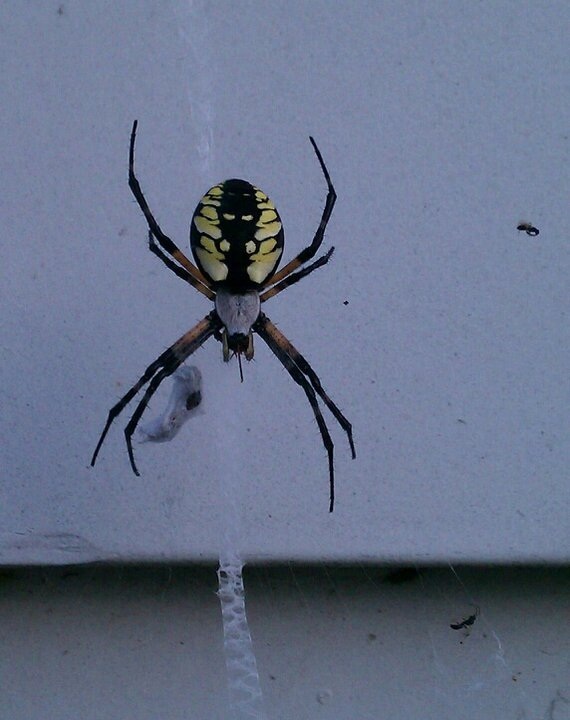 Just had a banded black and yellow argiope between the mail box and paper post in Goodrich. The web is incredibly strong. I pulled a strand off the side of the mailbox and it was like a piece of string. Just found one on my front porch in Whitmore lk,MI.I have never seen that kind here,is it poisonous? I remember a long time ago seeing one in a bush by our lamp post. My grandpa and I have never seen one before and this thing was huge! I am not certain it was this same spider but it looks very similar. The black and yellow pattern is very recognizable to me. Anyways, I like spider but my grandpa is fearful of them and smashed it with a shovel. I always will remember that spider because it struck me at how big it was. How do you share photos?? My parents have two Black and Yellow Argiopes on their porch. My dad observed the male build a large web, then a female took his place there while he spun a smaller one where he is now sitting. Is this normal? Do spiders "mate" like mammals until producing offspring? I've heard of spiders mating and then killing each other, or a lone female producing an egg sac, but these two almost seem like a married couple living side-by-side! Thoughts? been here in kalamazoo and a black & yellow argiopes sit at the wall of a warehouse. will post the pic on my blog. Ahhhhh! 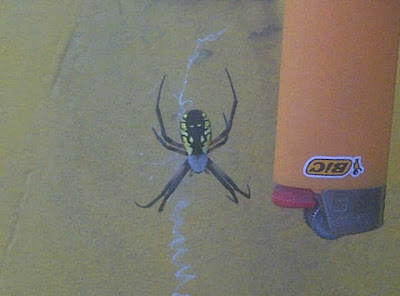 I was getting my mail and a small black and yellow spider came out of my mailbox. I knocked it off and when I looked down to see where it fell, a HUGE black and yellow Argiopes was on its web below my mailbox!!! Yes, I did scream!!!!! I also had a smaller one in my car a few days ago. It must be a takeover... I have never seen a spider so big in person.This is in Ithaca, Mi. We get these in our garden often. I have some great pics of these ones. Saw one at Dutch Hollow Golf Course in Durand,Mi yesterday. I have a huge Beautiful one outside my house in Michigan right now I've been feeding her crickets every night sense she arrived. I'd LOVE TO SEND U PICTURES OF HER! i have one hanging outside my living room window. did not know what kind it was til now. watched it catch a grasshopper. beautiful web. I just saw one in Lake Odessa Mi....went to get my phone to take a picture of it and it was gone! Oh my!! I have one in my back yard garden!